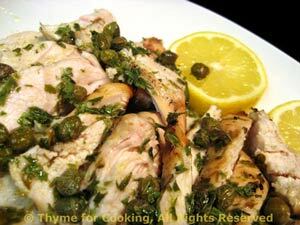 Easy Dinner from Thyme for Cooking: Grilled Chicken Piccata. Potato salads are always popular in the summer and every country seems to have their own version. Germany is lucky enough to have 2: German Summer Salad, which is normally served at room temperature, and this one, traditionally served hot. We usually eat it cold the second time... This makes enough for 2 meals. Slice potatoes - the long way, first in half, then in half again. Now slice (the short way) about 1/4 inch thick. We are aiming for bite size so if you have a huge potato, adjust accordingly. Chop onion, celery and pickle. Remove all but 1 tbs oil from pan. 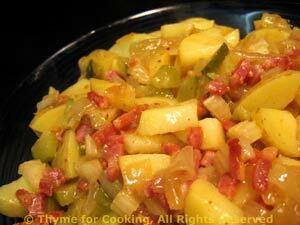 Add onions, celery to pan and sauté until tender, 10 - 15 minutes. This dressing is a combination of yogurt and mayonnaise, lending it a more traditional flavor. Slice the pepper into thin strips, then cut the strips in half or thirds. 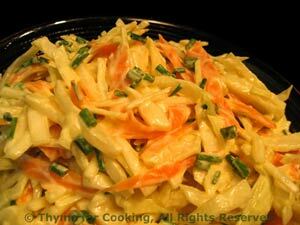 Put cabbage and pepper into a large bowl. Add half of the dressing and toss well to combine. Add more dressing according to taste and the amount of cabbage. In small bowl whisk yogurt or milk, mayonnaise, mustard and vinegar.